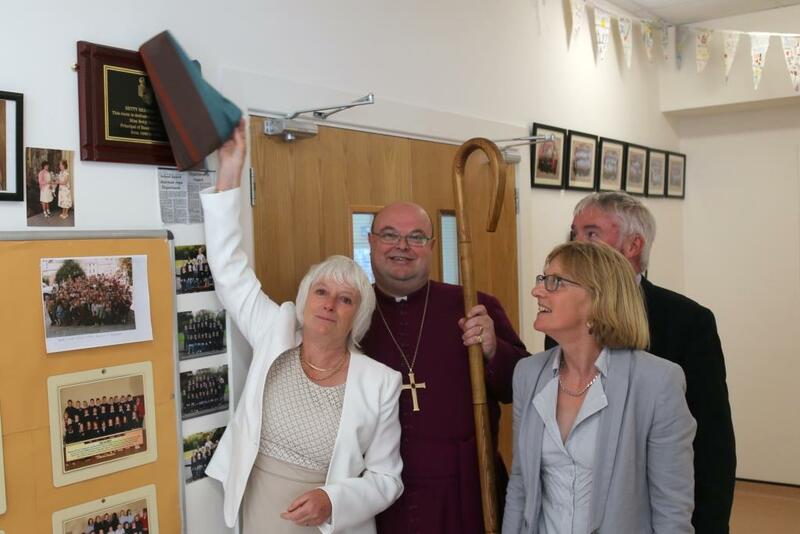 On Thursday, 25th June the Bishop of Cork, Dr Paul Colton, performed the official opening of yet another extension to Bandonbridge National School, Bandon, Cork. This is the second such development to be dedicated by the Bishop and to be opened at the school in recent years. The morning started with a Service of Thanksgiving outdoors in the school playground. At the conclusion of the Service the Bishop, as is the custom in the school, presented each ‘graduating’ member of sixth class with a Bible. Traditionally the class group then inscribes each other’s Bible. 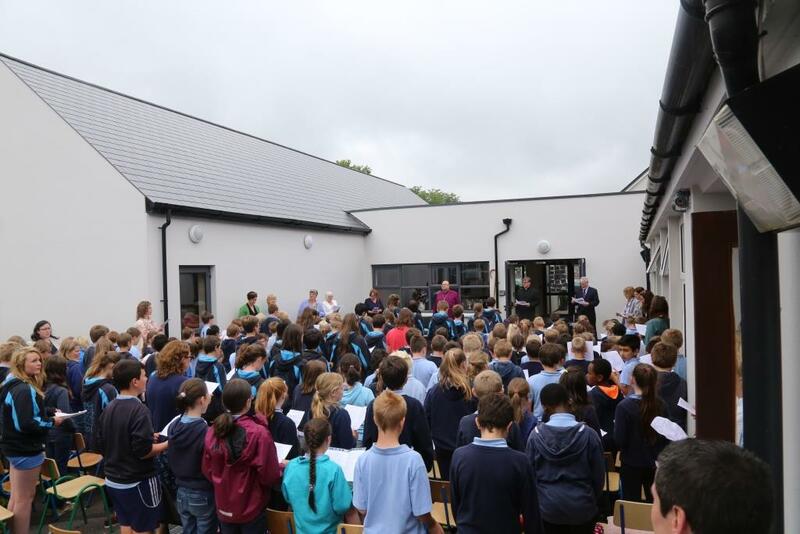 Students and teachers were then joined outside the new extension by the Board of Management, parents and guardians, past-pupils, visitors from other schools, and local dignitaries, while the Bishop dedicated the new building. 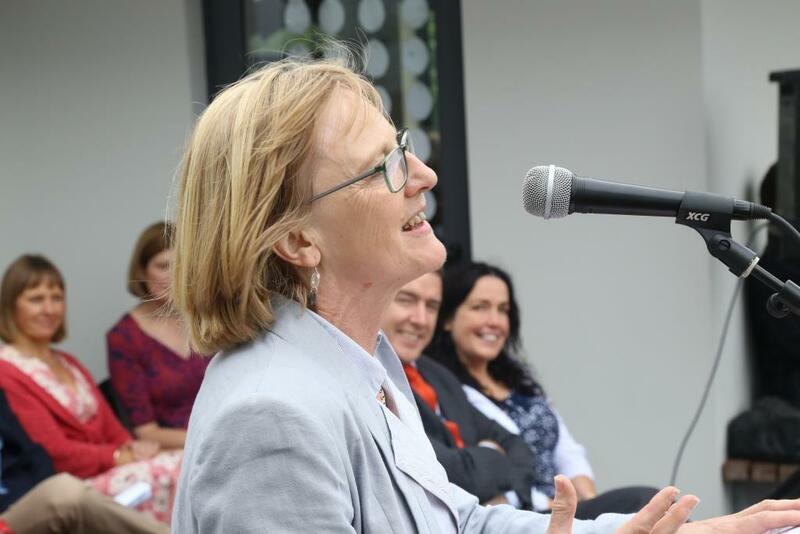 Mrs Harriet Pritchard, Principal of the School shared her memories of the school and expressed her gratitude to everyone for bringing the project to a conclusion. The chairperson of the Board of Management, Andrew Coleman, thanked each person involved in the project. 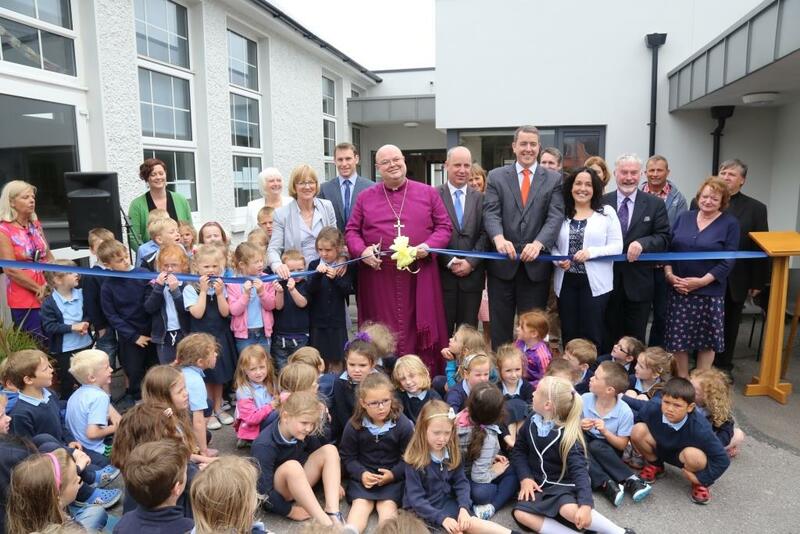 Before officially opening the extension and cutting the tape (assisted by junior infants and politicians alike), the Bishop thanked all the partners in the school for making it the great school that it is, particularly the children, parents, staff, Principal, chairperson and Board of Management. In addition to the grant from the Department of Education and Skills, the school community undertook significant additional fund-raising to achieve their goal for the school which has 212 pupils and 11 teachers. The transformation of the 1960s school building into a school hall is one of the features of the recent works. This was named in honour of the school’s famous Principal, Miss Betty Beamish. Her niece, Mrs Dorothy Verplancke (herself former Principal of Templebreedy National School in Crosshaven, County Cork) was present to recall the giftedness as a teacher of her aunt and to unveil a plaque. Among the guests on this occasion were Jim Daly, T.D., Michael McCarthy, T.D., Councillor Margaret Murphy-O’Mahony, and Councillor James O’Donovan. The local rector, the Reverend Denis MacCarthy, was joined by the Very Reverend John Kingston, Parish Priest of Bandon, the Reverend Denis Maguire from Bandon Methodist Church, and other clergy from the Diocese including the Reverend Peter Hanna, and the Reverend Eileen Cremin. Chairpersons of the boards of management and school principals from schools in the Diocese were also present, along with Mr Billy Skuse, Diocesan Secretary, and Miss Susan Perrott, secretary to the Diocesan Education Committee. Afterwards everyone enjoyed wonderful hospitality in a marquee erected by parents in the school grounds. Photographer Trevor Collins was on hand to take a host of photos and these will be available to peruse on this site later. Junior Infants, guests and local politicians help the Bishop with the official opening. From left (and third to the right of the Bishop) are: Mrs Dorothy Verplancke, Mrs Harriet Pritchard (Principal), Councillor James O’Donovan, the Bishop, Jim Daly, T,.D., Michael McCarthy, T.D. Councillor Margaret Murphy-O’Mahony, and Andrew Coleman (Chairperson of the Board of Management). This entry was posted in Bishop, Children's Work, Church in Society, Education, Official Opening, Schools in the Diocese. Bookmark the permalink.